Nijiya Organic Rice is grown and harvested in the beautiful fields of Sacramento Valley in California. The birds, weeds, and water from Sierra Nevada work together in harmony to help us humans grow our crops using organic methods only. Safe and savory, our organic rice is for you to enjoy for years to come. 1. Rinse rice well and soak with pretty of water for at least 20 minutes. Strain the rice well. Put rice in the pot with the equal part of water. 2. Cook with high heat with lid on. 3. Once it starts boiling, reduce the heat to low and continue to cook for 8 more minutes. Keep the lid on after turning off the heat to let the rice continue to cook with steam. Water 1.2 times of rice. 3. Once it starts boiling, reduce the heat and continue to cook for 15 to 20 minutes. Once all water is gone you hear crackling sound then add water and mix the rice well. 4. Continue to cook for another 10 to 15 minutes. Keep the lid on for 5 more minutes. It’s new ! Seafood & crab gyoza and fried crabmeat pate! A Nijiya’s new line up is tasty and healthy Seafood Crab gyoza. It is a sumptuous gyoza stuffed with full of hand picked crabmeat. The rich flavor comes from the harmony of Snow crabmeat, cabbage, green onion and Alaskan Pollack meat without any chemical additives. Sumptuous fried crabmeat pate is also a new line up. It is simply cooked to bring the flavor of Snow crab meat and Alaskan Pollack meat. They are great as dinner or as hors d’oeuvre. 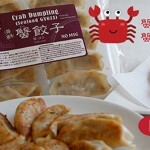 Enjoy Seafood & crabmeat gyoza and fried crabmeat pate with a rich flavor of the sea. From the popular request of our customers, it is finally here! 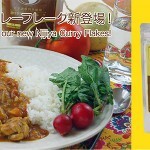 Nijiya Curry Flakes has a blend of 18 spices and 4 fruit juices. It does not contain any meat, it only has natural ingredients. Each ingredient is carefully selected to create a homemade style curry that is medium spicy, and kids will sure to love the sweetness that comes from the fruit juices. It is in an easy-to-use flake form which dissolves easily so it may be used in a variety of dishes such as stir-fries, karaage, croquette, and pasta. It is easy to use for grilled fish or meat! You can also mix with Miso or Mayonnaise to make vegetable dips! Mirin is made by brewing a mixture of rice, malted rice and distilled rice wine for a couple of month. 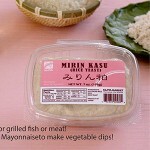 Marin kasu or Mirin lees are solids left after the mixture was filtered and pressed to make Mirin liquid. Marin kasu is rich in resistant protein which functions similar to dietary fibers. Many studies have shown it removes short-chain fatty acids from the small intestine and promote many medicinal benefits. Nijiya original Organic Salted Lemon Dressing, now available in stores! Nijiya’s original dressings has a new line up. 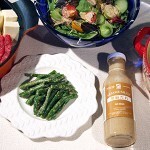 It is Salted Lemon Dressing using Organic sated lemon. Salted lemon is not just lemon with salt. The lemon is cured with salt and makes great condiment, which brings out Umami of ingredients with fresh lemon flavor and mild salty tartness. Nijiya’s original organic salted lemon was made with this salted lemon. You can use it for fresh salad or make Carpaccio with Sashimi. It makes a great rice salad or a beans salad. You can use as a sauce for Yakiniku and Gyoza. It has no MSG. 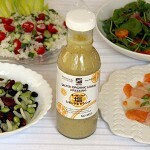 This refreshing lemon flavor dressing is loved by all ages, from kids to elders. 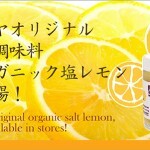 Nijiya original organic salt lemon, now available in stores! Last year all-purpose seasoning, salt lemon caused a big impact in Japan. Salt lemon is commonly used in places such as North Africa and Morocco. You can use this seasoning on meat, fish, and various kinds of vegetables also. Originally, the whole lemon gets seasoned with salt, but Nijiya’s original salt lemon is in a paste form, so customers can enjoy the flavor of its skin, and it is also easy to use for cooking. Lemon, of course organic! Salt that is used are the mineral-rich natural sea salt. Although salt lemon goes well with any food, we recommend salt lemon sautéed chicken. Since meat is plump and soft, acidity will also be mellow while heating, so it could be enjoyed by those who doesn’t favor lemon as much. Other seasonings will be unnecessary if lemon salt is used. It can also be used in salads and desserts. Nijiya’s original Sesame Sauce has a rich full flavor of roasted sesame made without MSG. 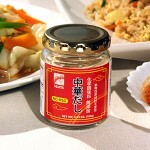 You can conveniently use it as a sauce for ShabuShabu, a salad dressing or a marinade. Try it for soup for a change. The recipe as follows. 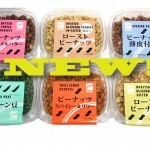 Nijiya Market now sells nut series! 6 Various types are available. Peanuts are popular, containing unsaturated fatty acids that are healthy and good for your body. Enjoy it however you like! Please enjoy our delicious and healthy nut series! Now on sale, Nijiya’s Chuka Dashi! It is finished in the taste of soy sauce and vegetables. Rich aroma and gentle taste, comes from the naturalism of additive-free chemical seasoning. Familiar granule type, it is easy to use. Please use It in variety of soups, fried rice, salad, and stir-fry. 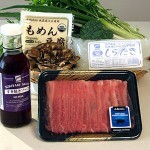 Sukiyaki sauce by Nijiya has NO MSG and is made with Kombu Dashi. It is easy to use and you can adjust flavors by adding more soy sauce or sake while cooking on the table. Natural Umami of this sauce will enhance the full flavor of the ingredients. This sauce is good not only for Sukiyaki but for cooking Meat and Potato, Tofu, Chicken Soboro and Katsu-Don, also. Try with your favorite recipe. Nijiya Market is making an effort everyday to provide safe, healthy and delicious food products to our customers because we believe that consuming better quality of food helps us become healthier in body and mind. As a part of this effort, we have been developing “Nijiya Brand” products now we offer than 100 varieties of “nijiya Brand” products at the stores. We set a high standard in product quality, and only the products that have passed our guidelines are available at the store. Because we are very serious about developing Nijiya Brand to provide better products to our customers for satisfaction, we proudly offer Nijiya Brand products . 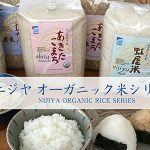 You can purchase Nijiya Brand products online. * Some products are only available at physical stores.